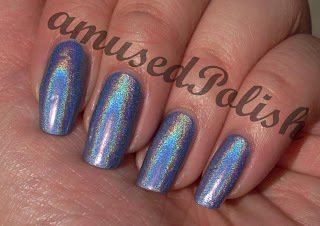 Today's day 2 of Holo week and we'll celebrate it with this blue holo. 2nite came out in the OMG Collection from China Glaze a few years ago and I think some of them are hard to find by now- which is understandable because these holos rock! 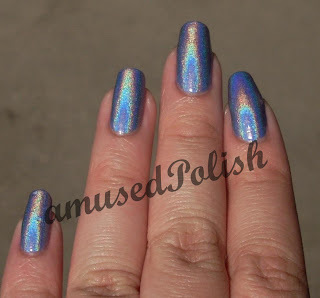 So, this particular one is a blue linear holo. It applied well in 2 coats and in my oppinion these are better to paint when you've got a decent amount of polish on the brush. They are drying fast so the thick coats aren't an issue. As most holos I don't top it with an topcoat and they wear pretty well because it lasted me about 3 days with minimal tipwear, no chipping. So I'm really impressed with these (who isn't?) but there's one little complaint: the paint/letters on my bottles aren't holding onto the bottle, which in case of the Kaleidoscope collection is really a pitty because the artwork on them is pretty and don't want half of it on my hands when I open a bottle of them. 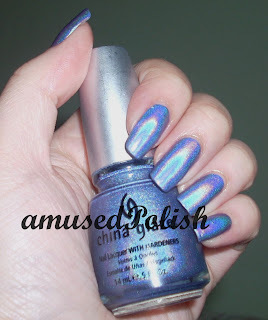 And I never had any similar issues with my other China Glaze bottles which is weird.